Register BEFORE 31 DEC & SAVE - BE PART OF MAKING CHANGE! If you have already registered for the Conference - we look forward to seeing you there. Please feel free to forward this eNews on to any friends or colleagues who may be interested in hearing about the Conference. 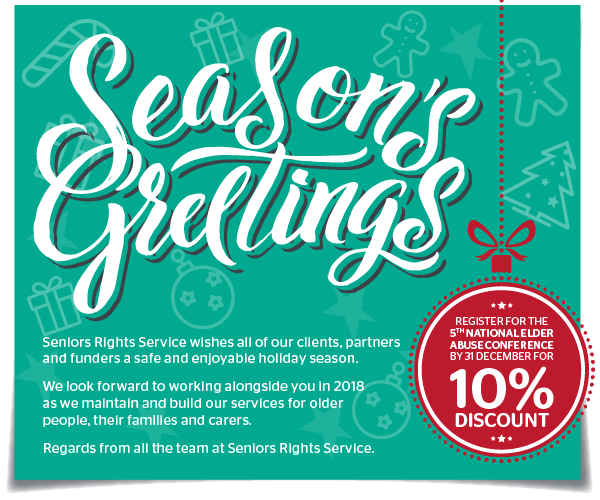 Register before the end of 2017 AND SAVE 10%*! I am thrilled that the NSW Government is supporting the National Elder Abuse Conference, to be held in Sydney in February 2018. “Together Making Change” is a strong message to encourage communities across NSW to speak out against inexcusable abuse inflicted on older people. We know that it is estimated that about one in 20 people aged 65 years and over have experienced some form of elder abuse. Psychological and financial abuse are the most commonly reported forms of abuse. We also know that sadly the abuse is carried out by people whom the older person should be able to trust and rely on, most commonly by their families. Together we need to loudly state that abuse of older people is abhorrent and intolerable. Together we can make the change to ensure older people have the right to be safe, to be treated well, and to live free from abuse. The Conference is a critical forum to bring together experts and advocates from around the world, to share best practice and plan future collaborations to increase awareness and reduce the incidence of elder abuse. I wish everyone who is participating or has an interest in the prevention of elder abuse a Merry Christmas and a Happy New Year! I will see you at the Conference. 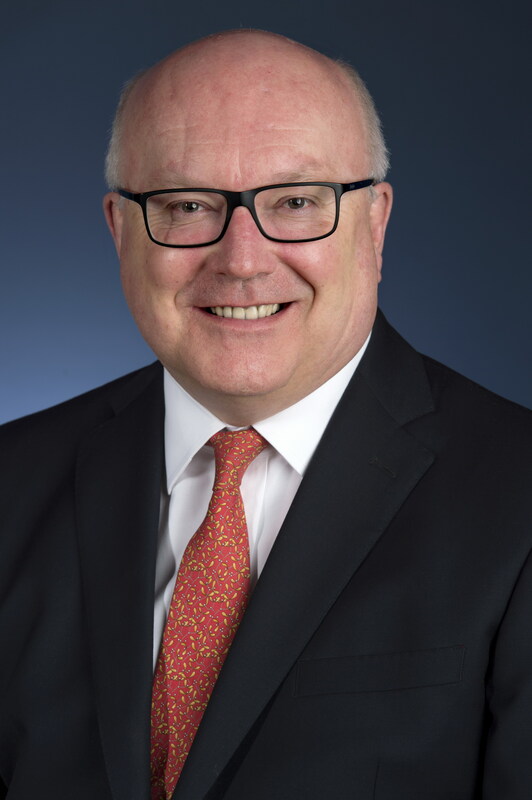 Seniors Rights Service is delighted to confirm that Senator the Hon George Brandis QC, Attorney-General, will deliver the closing plenary at the Conference. The program includes more than 60 concurrent sessions involving over 100 experts who are gathering to discuss how best to tackle Elder Abuse across all sectors of the community. Keep checking the Draft Program for updates in the Conference Schedule: Click here to view the draft program NOW! REGISTER HERE before 31 Dec 2017 & SAVE 10% on your Conference registration fee *NOTE: 10% discount only applies to your Conference registration fee , not the Conference optional/side events. 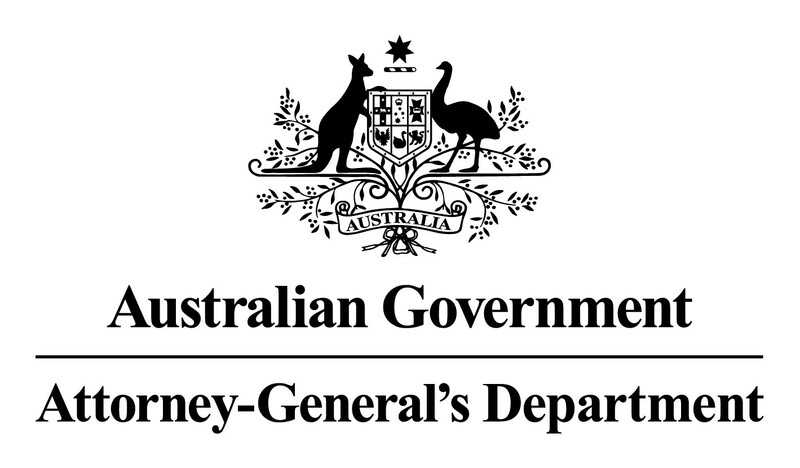 O ver the past two years Relationships Australia has provided services to families with ageing-related family relationship issues. The service responds to a large body of international research that identifies the vital importance of social connectedness to physical and mental wellbeing across the life span, particularly in later life. Ageing can contribute to poor family relationships in a number of ways. While the existing formal health and welfare systems provide a range of services for ageing Australians, older people with care requirements are predominantly looked after by their families. Longer life expectancies coupled with extended ageing-related illness may mean that the care phase lasts for a prolonged period, causing significant mental, physical and financial burden on older people, care-givers and extended family members. Where family care is no longer appropriate or available, relationships may become increasingly strained, particularly for families with complex structures, poor communication skills, or histories of relationship dysfunction, violence and abuse. Even when elders are in good health, decisions around retirement and inheritances can lead to family relationship issues, leading to prolonged family conflict that can permeate through burial arrangements, estate devolution and future family interactions. 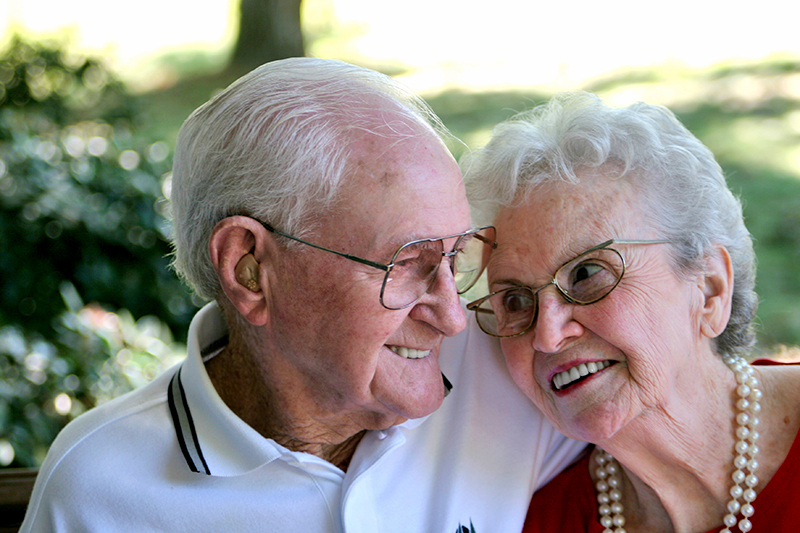 The Elder Relationship Service aims to support families to have difficult conversations in ways that improve relationships and protect the rights and safety of family members, with Relationships Australia identifying a high level of discomfort through the online survey it conducts each month when families need to talk about end of life wishes. Around one-third of people responding to the monthly online survey reported that they were uncomfortable talking about death, dying and loss, and while more than one-third of respondents had prepared a Will, one-quarter had not discussed their wishes with their family. Almost all survey respondents (95%) indicated they would like to donate their organs; however, almost one-third had not discussed their wishes for organ donation with their family. 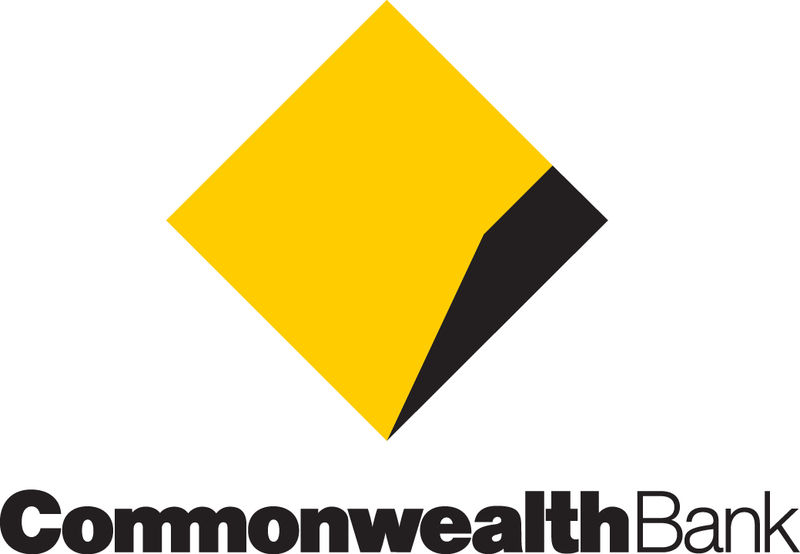 One-third of survey respondents were worried their family would fight about their parents’ aged care, personal possessions and assets. Conflict, poor communication and family relationship breakdown can lead to social isolation and loneliness, a significant risk factor for elder abuse, and in a monthly online survey conducted in January 2017, more than one-quarter of older respondents reported high levels of isolation. Around one-third of survey respondents reported that their family relationships were highly negatively affected due to financial worries and spending time with extended family at Christmas, alerting us to the need to keep in mind that Christmas can represent a period of increased loneliness and stress on family relationships, and a range of services are available to assist. 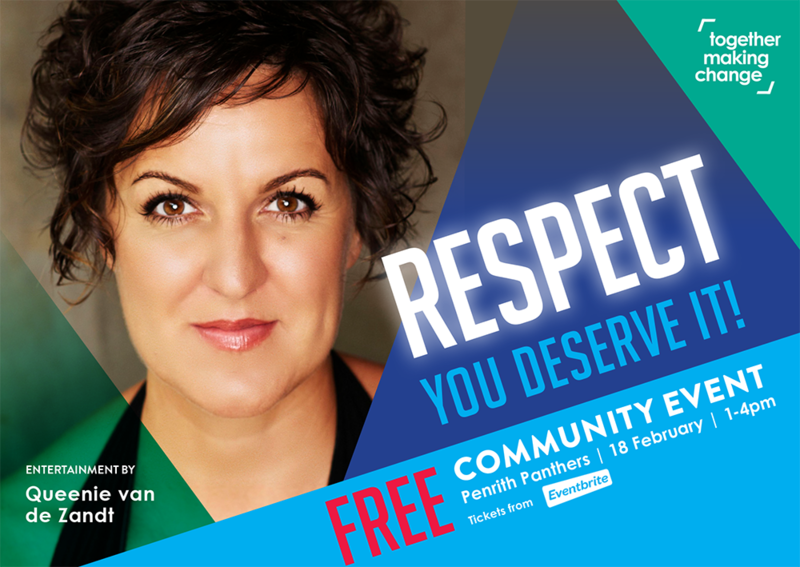 Seniors Rights Service and the NSW Elder Abuse Helpline and Resource Unit are pleased to co-host RESPECT You Deserve It a free community event in Western Sydney on Sunday 18 February as part of the Conference activities from 1-4pm. This event will be held at Penrith Panthers where high tea will be served and entertainment by the delightful Queenie van De Zandt. Throughout the day there will be information, Q&As, a quiz, entertainment, lucky door prizes, guest speakers and engaging facilitated discussions about the impacts of elder abuse, prevention strategies and how we can support each other. Prior to attending, the event participants will be asked about being videoed while at the event, particularly during the discussion activities. Some of the discussion will be presented on video at the 5th National Elder Abuse Conference on the following two days 19 -20th February. Please are limited, so book now for this event by clicking here. Interested in becoming a Conference Partner? This is a UNIQUE opportunity to demonstrate your organisation’s support for this important social issue. We have a limited number of attractive Partnership opportunities remaining that can be tailored to meet your specific marketing objectives. Click on this link to receive the 10% discount off your Conference registration fee only, this offer does not include the Conference optional/side events. Or visit the Conference Website and enter MAKINGCHANGE in the IDCode box on the first page of the registration process. The discount will be applied as you move through your registration.